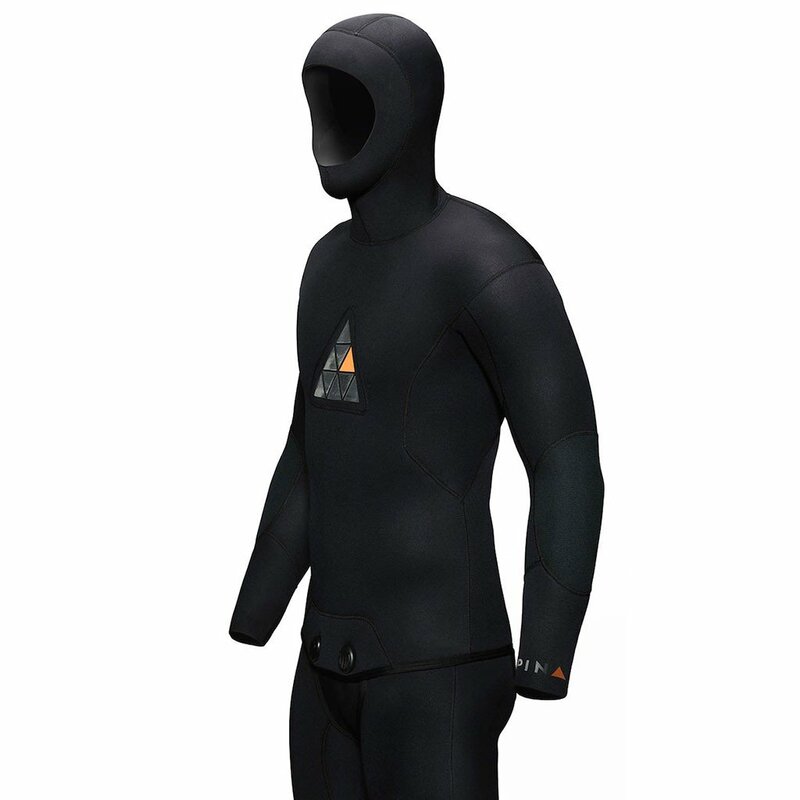 At Ninepin we have created a purpose-built no nonsense freediving and spearfishing wetsuit. The internal open cell neoprene strikes the perfect balance between flexibility, durability and warmth, resulting in a product that can perform at the highest level in a variety of diving conditions. The external nylon lining in dyed black offers protection against abrasions and the knees and elbows are reinforced with additional padding to further increase the durability of the wetsuit. These wetsuits are designed with minimal styling in mind, including subtle touches of branding to create a clean and effortless style in or out of the water. 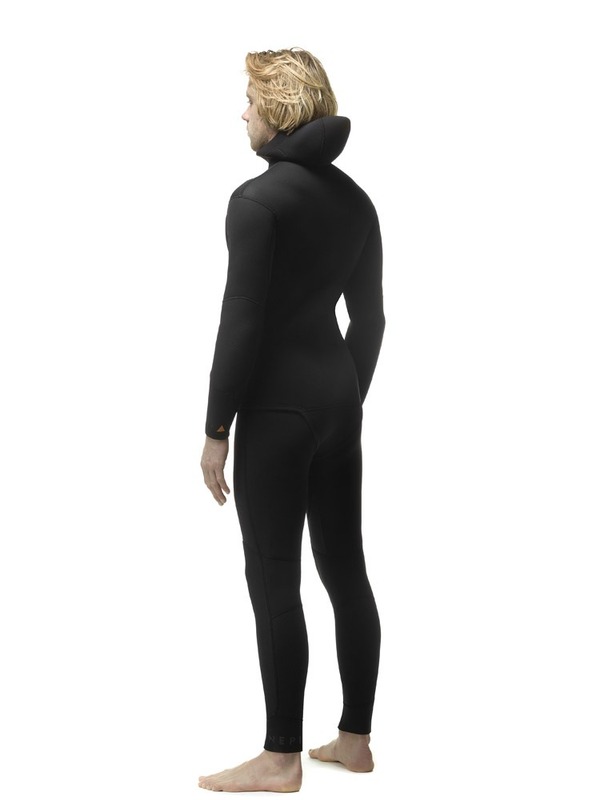 The Neoprene: We use an open cell interior Sheico L-Foam neoprene for this wetsuit as it offers the ideal properties for freediving and spearfishing. Flexible: It is important that a freediving wetsuit is flexible as you need to be able to move freely and easily to conserve oxygen. The result of this is an increased bottom time to shoot the perfect photo, spear a fish for dinner, explore the ocean or simply enjoy the moment. 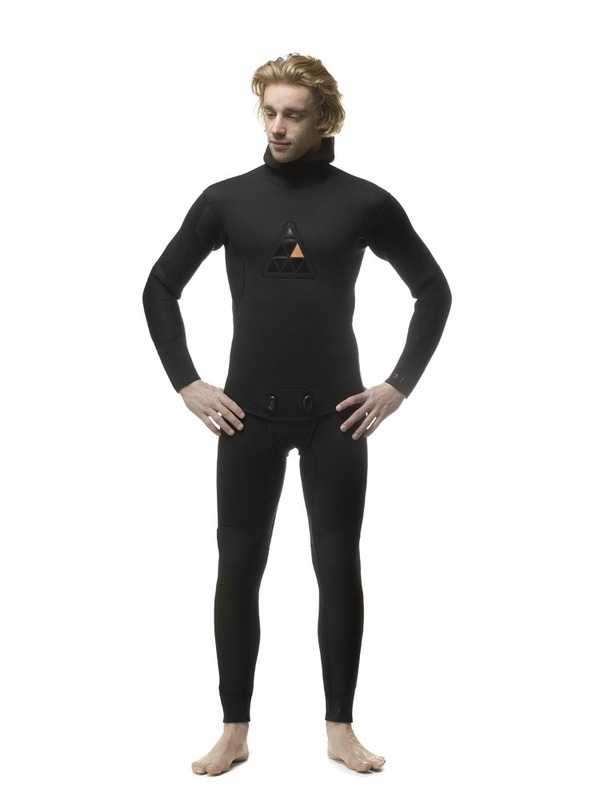 Comfortable: The neoprene has a soft feel against the skin and with an open cell interior the comfort is a level far above a standard lined diving wetsuit. Warm as Toast: The L-Foam neoprene with open cell interior is perfect for diving over long periods. This is often required when spearfishing, freediving training or just exploring the sea for hours on end. Open cell means there is no lining on the inside of the wetsuit. The open cell neoprene forms tiny air pockets, these pockets form a suction seal against the skin resulting in very little water movement inside your wetsuit. By referring to the temperature chart you should be able to stay in the water for 4 – 8 hours. Durable: We have tested this neoprene to depths of 40m to see how it performs under pressure. Some lower quality neoprenes can compress over repeated dives to depth. 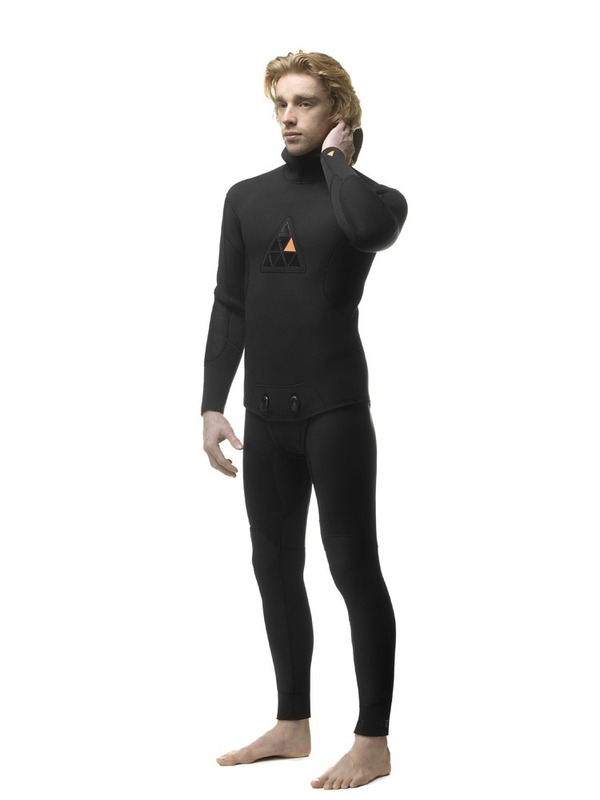 The Ninepin wetsuits performed very well and very little compression as witnessed over many dives. We have opted to include a lined nylon exterior. This protects against minor abrasions encountered on dives. The Cut: The Ninepin wetsuits are designed to fit snug to the body and should be worn fitted. See our sizing guide for more details. 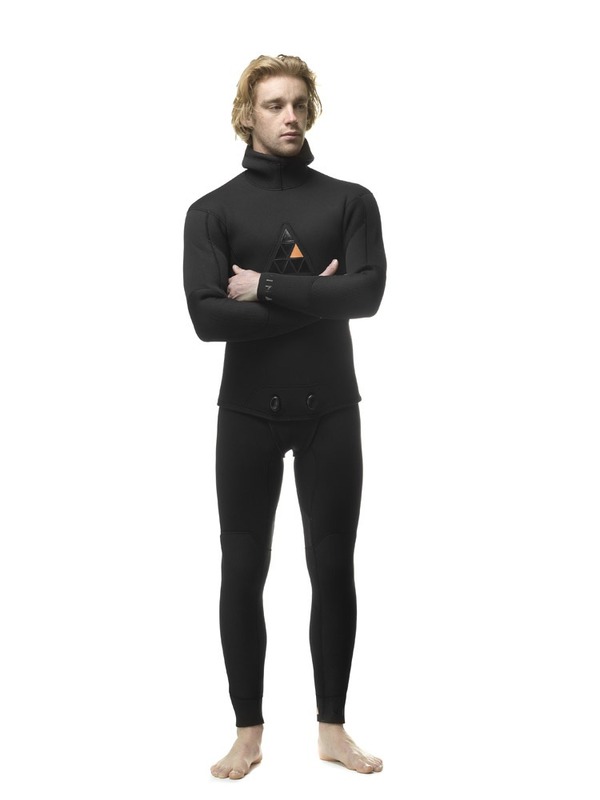 The shoulders and arms of the wetsuit have a natural bend for a comfortable fit. 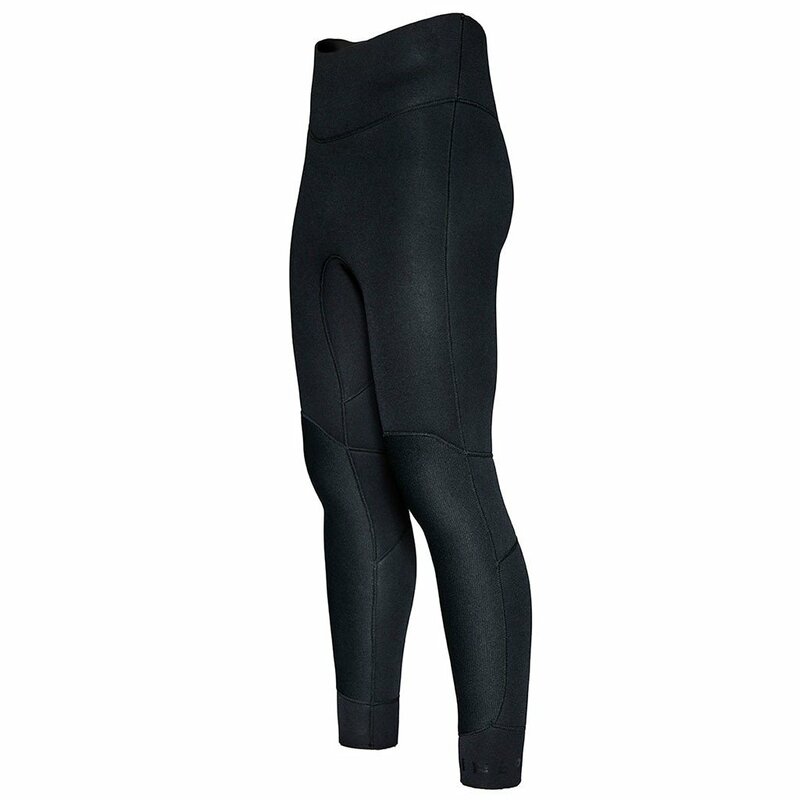 High Waisted Wetsuit Pants: We have opted for high waisted pants rather than long johns as through our freediving experience and research we have found high waist pants to be more comfortable and warmer. 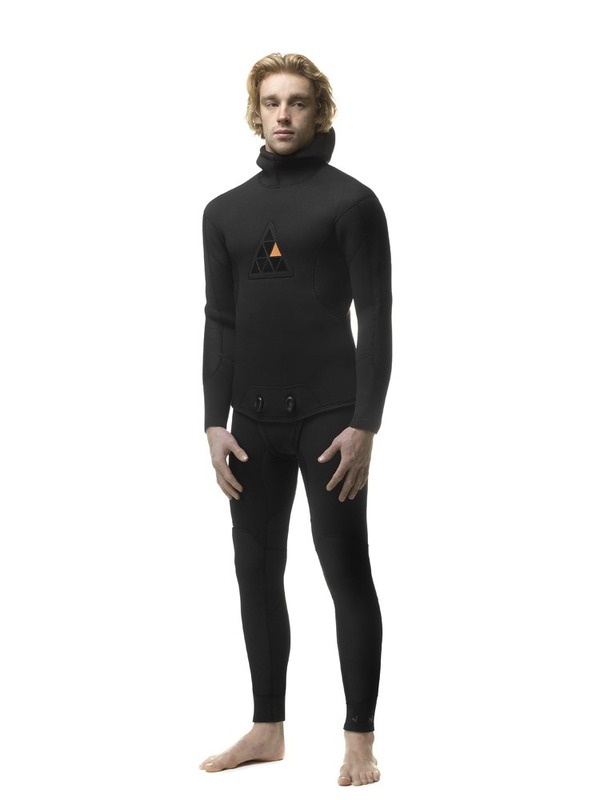 The high waisted pants have less restriction on the chest and abdomen when taking deep breaths required for freediving. They also have less restriction when streamlining with hands over head making this position more energy efficient, resulting in faster descents and ascents. Chest Pad: This is an essential piece of a spearfishing wetsuit. We have added an additional layer of 3mm neoprene in the centre of the chest to provide padding for speargun loading. The Look: The Ninepin freediving and spearfishing wetsuits are designed with minimalistic styling featuring subtle branding. 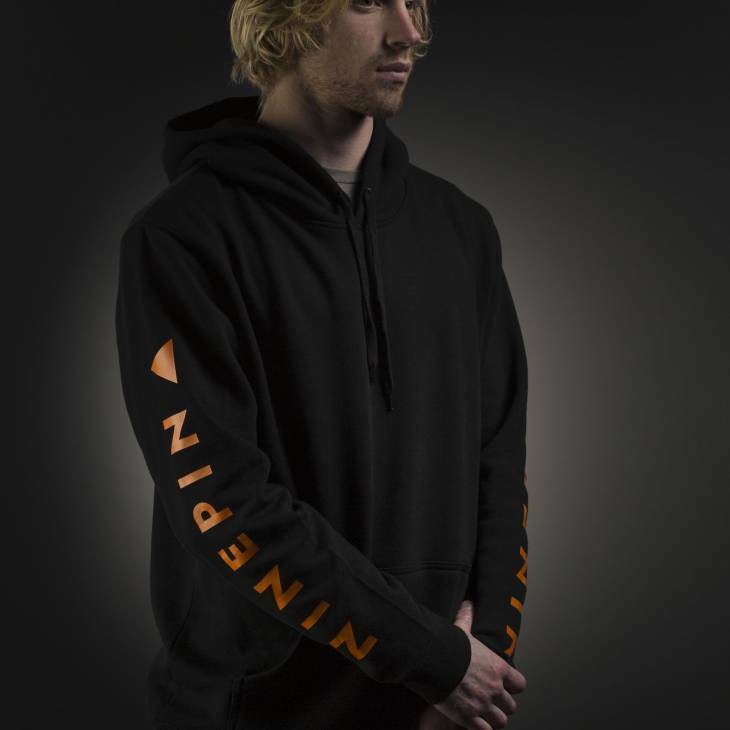 The ninepin logo is printed in black with the orange triangle icon on the left wrist cuff and the left ankle. 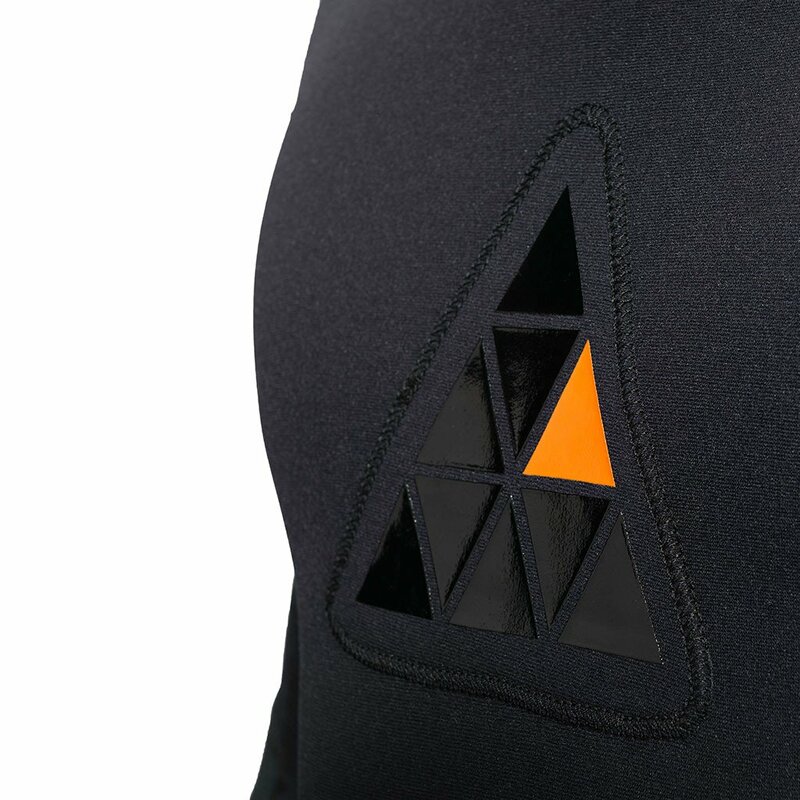 The chest pad also features a triangle print made up of subtle black triangles contrasted with one orange triangle to resemble the Ninepin logo and represent the Ninepin rock itself as a pyramid like formation standing alone in the Bay of Islands. Love the suit, great service and very quick delivery…could not fault…have recommended to friends. This has been my favourite e-commerce purchase to date. My suit was delivered to New Zealand overnight. The process was easy, convenient and personable. I finally got in the suit over Easter on the east coast of the coromandel. I purchased a 5mm suit and was comfortably warm for Autumn. I was diving for crayfish and mussels. The swell was of good size so the quality of the suit was truly tested as I was thrown against the rocks diving for mussels. Numerous times I was dragged over the rocks and the suit has no sign of any damage. For the fit, I was surprised with the flexibility. I normally surf in a medium size 4/3 steamer so I asked what would be best for my dimensions. When Shule (director) told me to go a for a small I was concerned but i actually had more movement in it than my surf wetsuit. Great product and fantastic transaction. Thanks guys! I just want to say it’s really very good , I used to use other brand but when i orderd this suit and DHL man came I really Surprised coz it’s light then thin not thick , I have 3mm other brand but it’s thick , heavy and no warranty . I strongly recommend for all. Fantastic. Needed the suit quickly before I went on holiday and it arrived in the UK within a few days. Brilliant service! The wetsuit was wonderful. It arrived within 2 days of payment. Thanks to the ninepin team for the sizing help and prompt delivery. Looking forward to getting gloves and booties! Wetsuit arrived within 24 hours of it being sent, the neoprene is high quality and the joints look tough. On testing it was super comfortable and a great fit, kept me super warm for a long cold session. Slipt on some rocks and grazed the suit whilst getting in, to my surprise the suit didn’t tear or show any damage whatsoever, really durable. Absolutely stoked with the suit, only thing better than the suit itself is the price! After being a loyal user of their 3mm suits (Early production model from way back!) I finally got my hands on the 5mm this winter. Amazing comfort and elasticity, and still feels like a second skin in the water. Prefer my 3mm for shorter dives as it is less floaty but other than that the 5 is an amazing piece of technology, no, art! Kept me perfectly warm in 13c waters! A very well fitting,and more importantly warm 5mm suit!Great for spearfishing and freediving in these colder months.Can’t wait to get a 3mm suit for the summer! Cheers, Kev S.
Great wetsuit guys, a little lose around the arms but noting problematic. Would definitely recommend to others. Thanks again. Couldn’t be happier with the purchase…. Super warm, comfortable and looks sick! Best fitting 5mm suit I’ve ever bought!Super warm and comfortable even after 3-4 hours spearing,and the quality & service is A1! Amazing 5mm wetsuit. 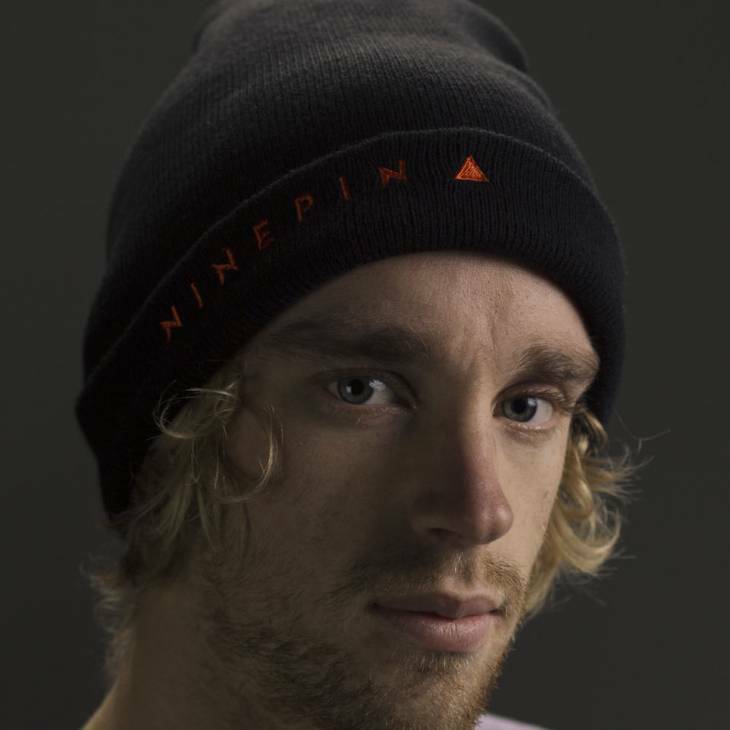 Great customer service from the Ninepin team. These suits are crayfish magnets…….be careful they don’t end up on your leg. Although if they do the wetsuit will survive! Ordered the suit a few months ago and was pleased with the speed of shipping and delivery. First thing you notice when you get the suit is the great design, I really like the orange on black with the minimalist details. Performance – I’ve been using the 5mm suit now diving over the southern Tasmanian autumn and winter for abalone . Water temp from 10 -13 degrees. The fit is great and there is good flexibility all round. The warmth has been really good, extending my dives and keeping me toasty. Have hit the rocks a couple of times now and the suit has held up really well. Have been, and will continue to recommend the suits to friends and can genuinely say that it is a great suit at an unreal price. Dove Port Phillip Bay 2 weeks ago water would have been all of about 10 degrees, not that i noticed because my suit was so damn warm A+ on a top notch wettie guys! Finally a company that cuts through all the BS to offer an affordable “no nonsense” suit with everything you need and nothing you don’t. Responsive customer service recommended I size down to a Medium @ 104cm/86kg/184cm and it fits like a glove. Keeps me warmer and more flexy than I’ve ever been here in SoCal! Easily slip into the open cell like an eel with just some soapy water. Shipped to US in no time. Highly recommend.